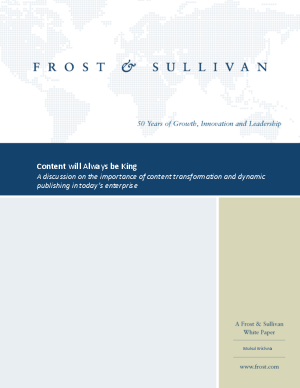 Modern enterprises are increasingly aware of the evolving role and significance of digital content within their organizations, and many have been looking toward the media ecosystem to resolve greater organizational content creation and management requirements. This whitepaper explores the mantra to achieve success in real-time, multi-channel content transformation and distribution, boosting enterprise collaboration and streamlining workflows. Even the best corporate strategy, business plan, marketing campaign, etc, is useless if it cannot be communicated and used effectively and in a timely manner.